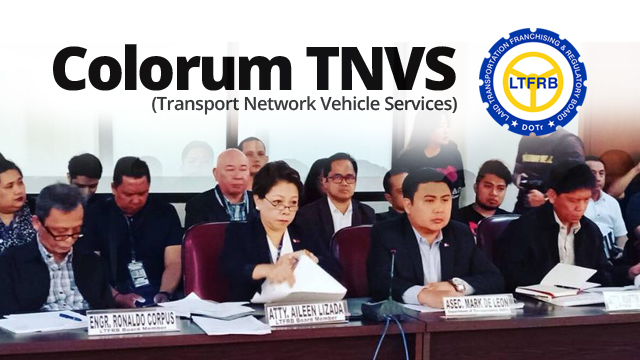 The Land Transportation Franchising and Regulatory Board (LTFRB) has agreed to push back the crackdown on unauthorized or “colorum” transport network vehicle services (TNVS) providers, which was set to begin on September 1. The LTFRB has not announced a new date for the crackdown yet but the board will convene early next week to discuss the matter, LTFRB Board Member Aileen Lizada said during the second technical working group meeting of the Committee on Transportation of the House of Representatives on August 30, Thursday. ‘Colorum’ TNVS providers refer to ride-sharing vehicles that operate without an LTFRB-issued certificate of public convenience (CPC), a two-year permit to operate as a public utility vehicle, or a provisional authority (PA), a temporary permit issued to vehicle owners or operators going through the CPC application process. PAs are renewed every 45 days. The postponement comes after several TNVS groups raised concerns over the short period of time allotted to process the necessary papers. The LTFRB, on the other hand, admitted that they only announced the supposed crackdown to press unauthorized TNVS to register given the low percentage of applications they have received since they opened the process in March. In a statement issued August 23, the LTFRB said TNVS providers in the master list should file applications for CPC by August 31 or face the risk of impoundment when the agency starts to run after unauthorized ride-hailing vehicles by September 1. “The reason why we put up that announcement is precisely to compel the TNVS. Kaunti lang ang nag-apply. If we are to be serious about the issue of the colorum across all modes of public transportation, we will probably have to prepare for September 1. But that was not the original purpose of having to prepare for anti-colorum. It’s precisely to bring those TNVS without franchises to come to LTFRB to apply,” LTFRB Chairman Martin Delgra III said. “So actually, we are prepared to postpone for September 1. For so long as ‘yung nasa listahan ng master list, pupunta sa LTFRB para mag-apply. Para matapos na itong problema ng mga TNVS na walang PA, walang prangkisa (So we can settle this problem of TNVS operating without a PA and without a franchise),” he added. There are 55,000 units included in the official “master list” of TNVS submitted by Grab and Uber early this year. Prior to the crackdown announcement, the LTFRB said they have received 21,878 applications for CPCs and PAs. This increased to 22,660 as of August 30, implying only 782 applications were received since the agency issued the warning more than a week ago. Overall the LTFRB has been able to issue 4,719 CPCs and 15,763 PAs to TNVS units, bringing the total number of authorized TNVS to 20,482. This is a slight improvement compared to 18,741 authorized vehicles at the time LTFRB made the crackdown threat.